VIX/SPX Option Calibrator | SciComp Inc.
SciComp’s VIX/SPX Option Calibrator is a stand-alone, ready-to-use module that calibrates a universal volatility model jointly to SPX and VIX options while generating prices and sensitivities under the calibrated model. The calibrated model comprises either parametric or non-parametric local volatility surface, a mean reverting stochastic volatility multiplier and simultaneous jumps in both asset level and volatility. All three components - local volatility, stochastic volatility and jumps are required to simultaneously match both SPX and VIX volatility surfaces. The calibrated model generates prices and sensitivities for traded SPX and VIX options and is ideally suited for identifying arbitrage opportunities or pricing and hedging OTC volatility contracts. The model is calibrated using both forward (Fokker-Planck) and traditional backward PDE solutions. For the non-parametric local volatility option, given a set of stochastic volatility and jump parameters, the local volatility surface is determined such that all SPX implied volatilities are matched. These stochastic volatility and jump parameters are calibrated using a least squares optimizer to yield a best fit to VIX volatility smiles at a selected expiration or expirations. For the parametric local volatility option, stochastic volatility, jump and local volatility parameters are calibrated simultaneously, typically for a single VIX expiration and one or more nearby SPX expirations. 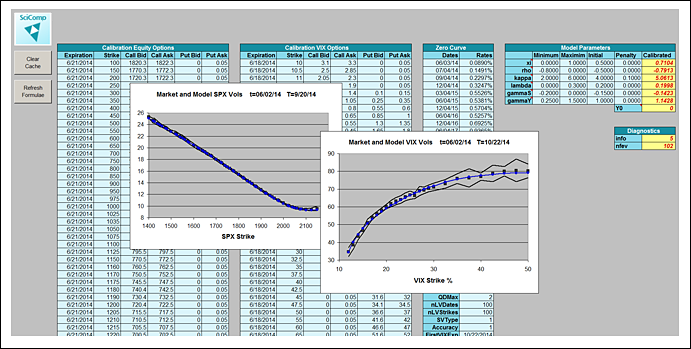 Sensitivities of both SPX and VIX options to model parameters are provided. In addition to option prices and sensitivities, calibrated model parameters (local volatility surface and stochastic volatility and jump parameters) are output. Whether you choose the stand-alone VIX/SPX Option Calibrator, or choose to pair it with the SciFinance code synthesis engine for pricing other volatility contracts, you will have a powerful tool for volatility trading and risk management. The VIX/SPX Option Calibrator is available as an Excel spreadsheet and add-in or as a Windows/Linux executable. 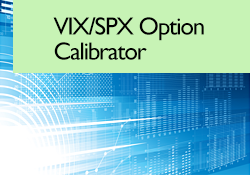 Need more information on the VIX/SPX Option Calibrator?